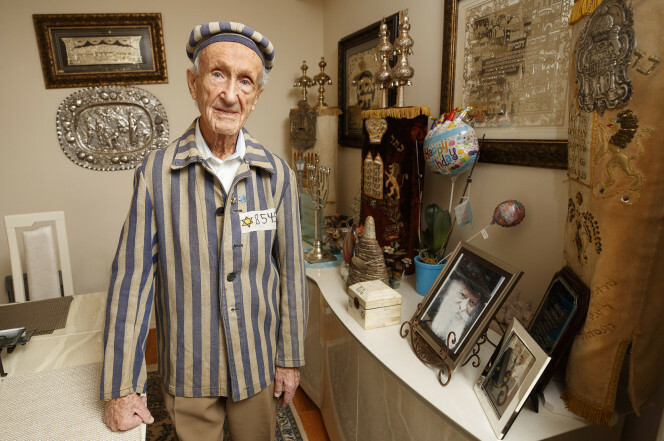 Ed Mosberg’s hands stay steady as he slips into the striped cotton jacket and matching cap — an outfit identical to one he was issued 75 years ago, as a prisoner of the Plaszów concentration camp in Poland. Although it brings back unspeakable memories, the 92-year-old occasionally dons the uniform, “so people remember [the Holocaust] happened. When I wear the uniform, they know,” Mosberg told The Post. He still wears his original number plate — issued by camp guards as a way to dehumanize Jewish prisoners by taking away their names — every day. It’s now strung on a gold bracelet to replace the wires that once covered his wrists during his four years of hell. He is the sole survivor of his family, as Mosberg’s parents and two sisters all died in the camps. Born in Krakow, Poland, to an engineer father and a mother who helped run the family haberdashery, Mosberg was 13 when World War II began. In 1941, the family was forced into the Krakow ghetto, but not before Mosberg’s father was rounded up with some other men and never seen again. In 1943, the ghetto was “liquidated”; his mother ended up in Auschwitz, where she was murdered. The kids went to Plaszów. There, Mosberg worked in the office of notorious Nazi Amon Goeth, portrayed in the film “Schindler’s List” by Ralph Fiennes. He recalls the machinations of the monster commander, like when a mother was holding her child. “They took the infant out of the mother’s hand and smashed it against walls and it was killed instantly,” Mosberg recalled. His sisters were not so lucky. That same day, the two were among some 7,000 women who were lined up on a Baltic beach and shot dead. Mosberg was so beaten down that when he was free to go, “I didn’t want to leave — I didn’t know where to go,” he said. Mosberg worked three jobs a day, including sewing pocketbooks for 50 cents an hour, before carving out what would become a successful career in real estate development. For the recent Holocaust documentary “Destination Unknown,” he returned to the site of the Mauthausen camp, wearing his prisoner uniform and carrying a hard rubber whip just like the one the Nazis used to beat him. He bought the paraphernalia from collectors over the years, paying $50 for the hat and a couple hundred dollars for the jacket, to which he added his number. Jonny Daniels, founder of the Holocaust foundation From the Depths, estimates that, of the 500,000 Jewish survivors of the Holocaust, only 100,000 are still alive today. Mosberg’s wife, now 90, is bedridden and still has nightmares about her time in the camps. Mosberg, too, is stuck there. “[Cesia] will tell you that I never left the concentration camp,” he said. He sees it as his life’s mission to keep that memory alive.